Camping is one of the proven ways or reliving stress. It is also believed that those people who go for camping frequently are more energetic than those who spend time in crowded places. However, you need to do thorough preparations before you hit the road. Definitely, you will need some tools and accessories when you are out there which will make your camping successful. A camping cooler is one of the most important things you should have. This device will keep your drinks cold and you food fresh when camping. However, you need to be very careful because not all coolers on the market are of high quality. Choosing the right cooler for camping is no longer a hard task since we have compiled a list of the top camping coolers you should consider. Which ones are they and why are they the best? We shall explain this in details in this article. 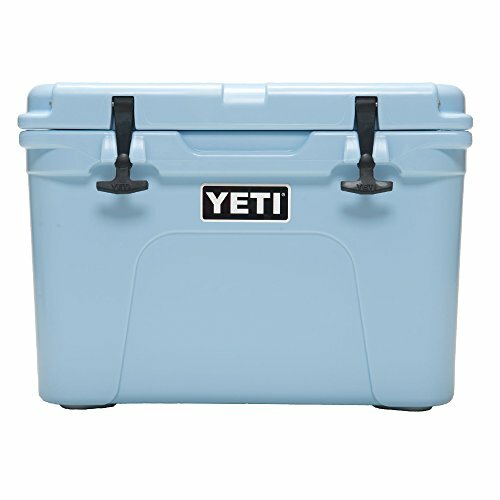 If you are searching for the best cooler for camping, YETI Tundra 65 Cooler is the best you should consider. It is made of quality materials and it also has an excellent ice retention capacity. 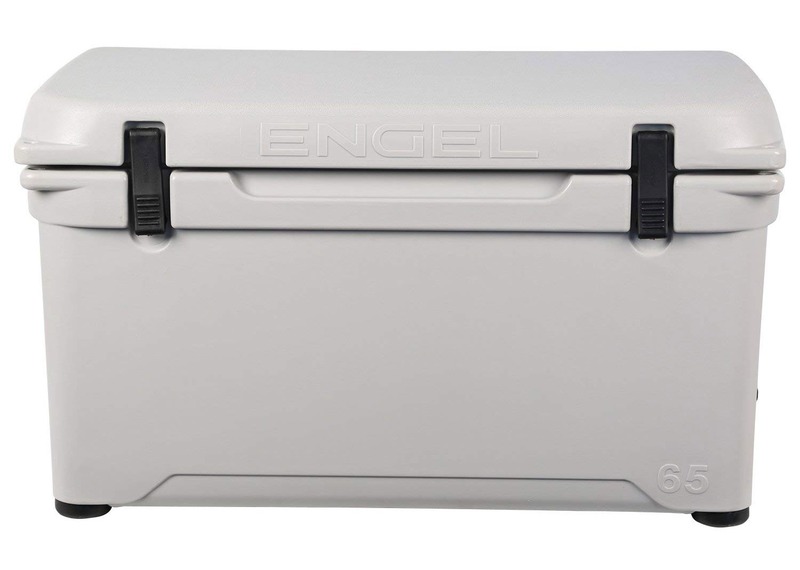 Engel Coolers High Performance ENG65 Roto-Molded Cooler comes second in our list. The most outstanding thing about this unit is that it is IGBC certified. If you are on a budget, it is among the most affordable coolers you can find. 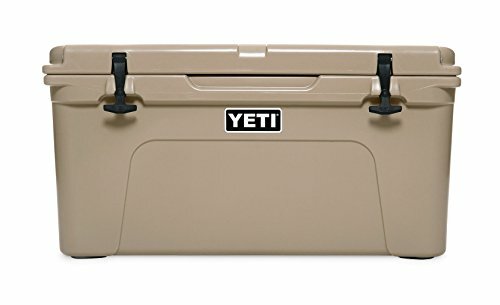 YETI Roadie 20 cooler comes third in this list. It features a vortex drain system and it last longer as compared to the cheap model since it is made of robust materials. In recent years, it has become very difficult to determine the best cooler for camping since there are thousands of options out there. The following tips will be of great help when shopping for a cooler for camping. Durability – Remember that the cooler will be subjected to a lot of abuse. Sometimes you will need to dump it at the end of your vehicle or it might even fall accidentally. Therefore, you need to look for a cooler that is made of long lasting materials. If possible, look for a unit that it UV resistant. Portability- When you are heading to camping, loading and offloading the cooler might not be an easy task if it is not lightweight. The best cooler should be very easy to carry. 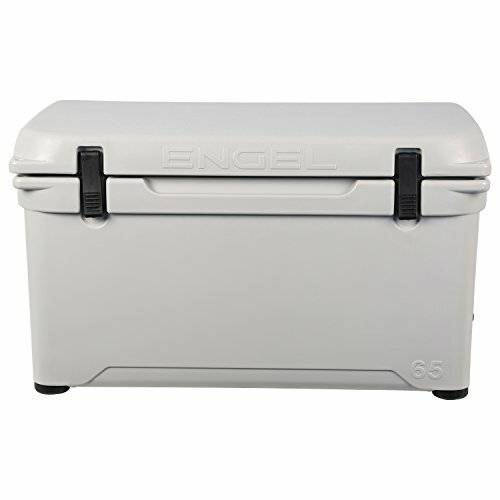 Handles – A good cooler should come with comfortable handles which will allow you to lift it up and move with it easily. Storage Capacity – The size of a cooler is determined in terms of quarts. If you have a small family, you can look for a small cooler but if you have a large family, you need to look for a cooler with at least 60 quarts. Ice retention – A good cooler should have an excellent ice retention capacity. The best cooler should have an ice retention capacity of at least 6 days. This means it can keep your food and other perishable items safe for several days. Warranty – The product’s warranty can help you determine the quality of a product. A good cooler should have a warranty of at least 5 years. It would even be better if you purchase a product with a lifetime warranty. The best thing about the coolers in our list is that they have an excellent ice retention capacity. They are also made of quality materials which allows them to withstand harsh conditions. Additionally, they are spacious enough and can hold most of your products. Another thing is that they come with comfortable handles which allows you to carry them easily. 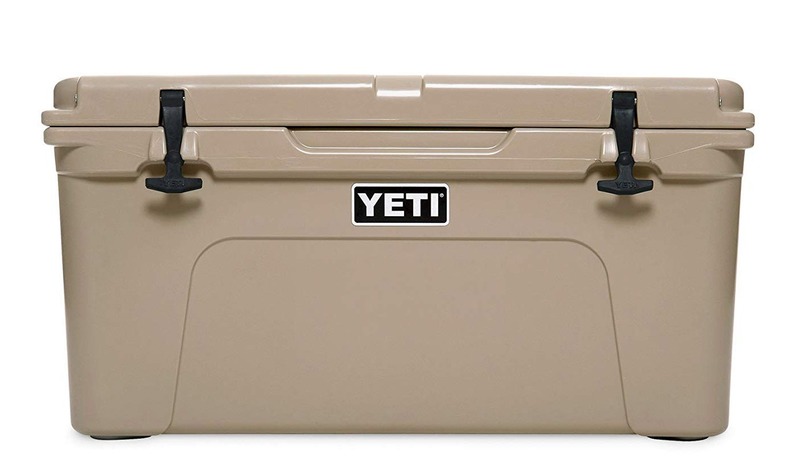 Yeti Tundra 65 comes first is our list as the most reliable cooler for camping. If you are not on a limited budget and you just need the best cooler, you can’t go wrong with this one. We realized that it comes with unique features as compared to others. As you can see here ,it has so many positive reviews and this is a prove that you will be investing in a quality product. The first thing we noted is that it is well insulated and as a result, you can put your dry ice in the cooler without any problem. It contains 3-Inch thick insulation on each wall. Secondly, it has a high quality lid which prevents the cold air from moving out of the cooling compartment. 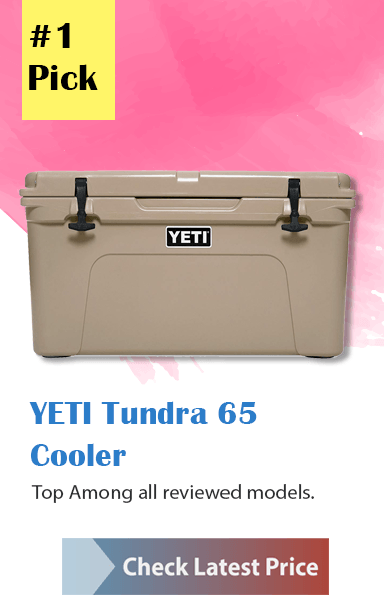 If you are searching for a unit that will keep everything extra chilly inside the cooler, Yeti Tundra 65 cooler is the best. When using the cooler, you can be assured that it will keep your drinks cold for up to 10 days depending on the temperatures. You should also note that it is made of quality materials which enables it to last longer than others. Due to its strong construction, the cooler is more expensive than others. It is spacious enough and it can hold up to 150 cans. It might not be the best for those in need of a lightweight cooler. However, you can comfortably move it in and out of your car if you would like to carry it when hiking. You can also use it as a chair or a bench for 2 people. You can get it at a discounted price from Amazon. It keeps the items cold. It’s a bit heavy and not suitable when traveling. 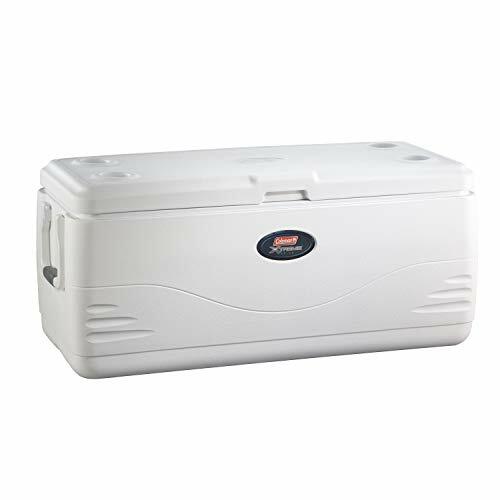 Summary :- This one is one is the best cooler for camping. It is durable and spacious enough to accommodate your items. Engel ENG65 Roto-molded comes second as one of the most efficient coolers you can find out there. If you are searching for a reliable cooler that can keep your food fresh for at least 5 days, this one will be a perfect choice. It comes with grade compression latchets and a silicone gasket which ensures that air does not leak from the cooler. Remember to clean the silicone gasket thoroughly after use. You should also note that it has a high level of insulation. 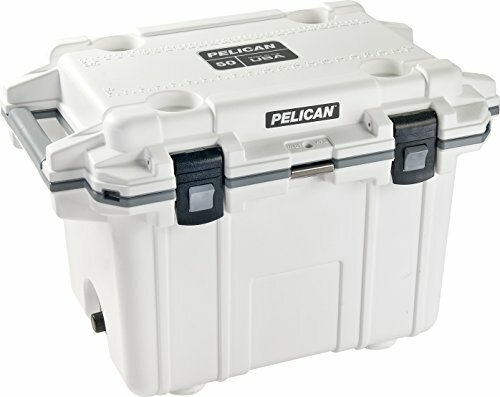 It features a solid 2-inch polyurethane foam around the cooler. It also features an Anvil Hinge which allows the lid to remain upright when open. This is a very important feature especially when you want to get something from the cooler and you are holding other items in your hands. The feature also comes in handy when you are searching for something in the cooler using your two hands. Another exceptional thing we noted about the unit is that it is IGBC certified bear resistant container. This means it is a long lasting unit. Unlike others, it comes with an inbuilt bottle opener and the extended handles enables you to carry it easily. Extended handles makes it easy to carry. Handles might be uncomfortable at times since they are made of plastic and rope. Summary :- The best thing about this cooler is that unlike others, it is IGBC certified. It also comes with extended handles for easy carrying. However, it might be a bit hard to clean. 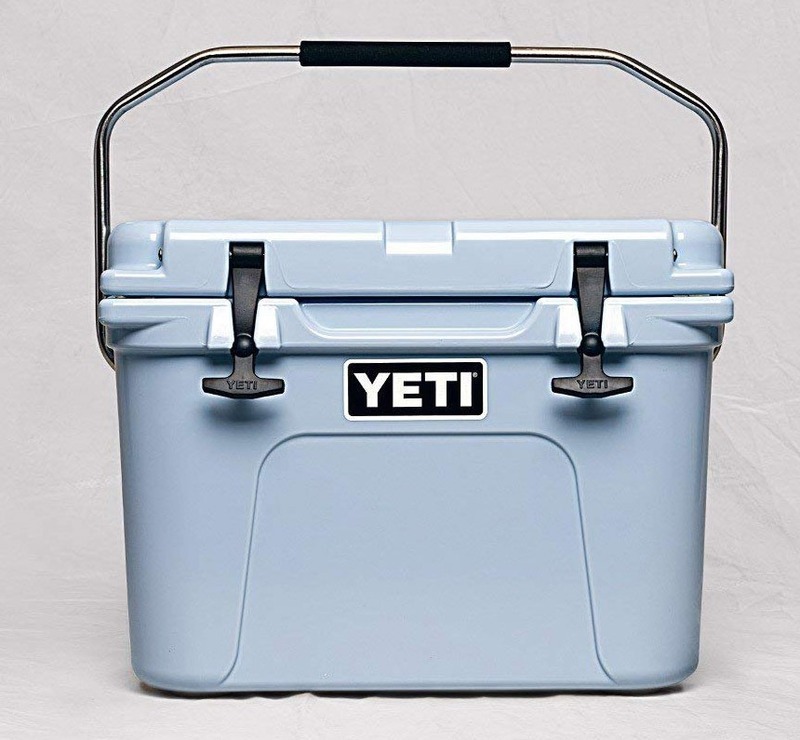 YETI Roadie 20 cooler is another top rated cooler in our list. Unlike others, it has an outstanding simple but robust design which gives it an attractive look. It is small in size which makes it a suitable option when traveling. The edges are round and smooth to ensure that they do not damage your vehicle or even hurt you when carrying. On top of that, it features a rotatable metal hand with soft padding. This allows you to carry easily even when it is full. We should also mention that it is bear resistant certified. If you like a specific color, you will be happy to note that the unit is available in different colors which includes; Ice Blue, Desert Tan White and LE Coral. It is not one of the most affordable units but you will get value for your money. Another thing that is worth mentioning is that it has a Vortex drain system which allows the melting ice to exit through the draining hole. This system also allows water to move from the cooler easily. You will also find that it features T-Rex lid latches which are made of quality rubber. These latches ensures that the lid remain locked to prevent air from leaking. The best thing is that you can easily remove them when you they are not in use. You should avoid placing it directly to sunlight if you want it to serve you for a long time. Lastly, this unit comes with a 5 years warranty. It has a vortex drain system. Summary :- This one is another top rated cooler which comes with a vortex drain system. It also comes with a 5 years warranty. However, it is a bit expensive. 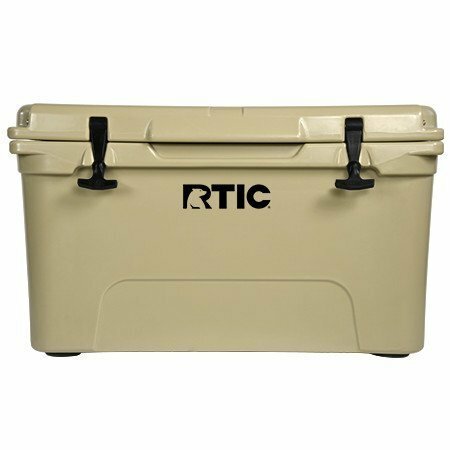 RTIC 45 is another top rated cooler which outperforms most of the expensive models due to its incredible features. It measures 26.5 X 16.5 Inches and weighs 25 pounds. You can also find it in 3 different colors which includes; Blue, White and Tan. One of the most outstanding features of this unit is that it has a superb ice retention capacity. This means that the ice can last up to 10 days which makes it perfect for camping. Additionally, it can hold up to 45 cans of beverages. It also has an exceptional shock defense and impact resistance. On top of that, it is able to withstand extreme weather conditions. If you are looking for a long lasting cooler, it might be a great option since it is made of quality materials. It is very versatile and as a result, you can use when fishing, boating, trips and tailgating. In addition, it has an insulation of 3 inches thick and features an impenetrable seal. Apart from using it for keeping food, ice, drinks and perishable goods, you can also use it as a table top, bench, and stool. The non-skidlid can also be used as a cutting board. It also features inbuilt lock for safe closure. Lastly, it has a rotomolded handle and body with long lasting latches. Ensures that the internal temperatures remains cold. Rubber straps prevents the lid from closing. Summary :- This one has an excellent ice retention capacity. It is durable and comes with drain spouts. It is also spacious. ORCA with Lid & Bottom coolers is among the most reliable camping coolers you can ever find. ORCA with Lid & Bottom coolers is among the most reliable camping coolers you can ever find. 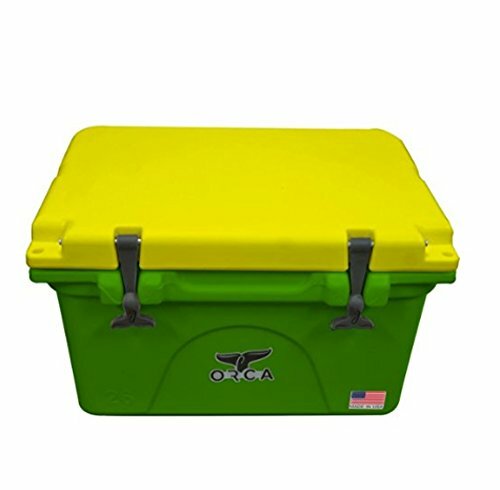 ORCA coolers are among the most reliable coolers you can find on the market and this cooler is not an exception. It will keep your food and refreshing drinks safe since it features an integrated insulation. It is able to keep any perishable goods for a long time at 90 degrees temperatures. Additionally, it has a rotomolded construction and as a result, it is durable and won’t crack or leak easily. This construction also enables it to withstand scrapes, bumps and other impacts which can cause damage. You shouldn’t worry when investing in this cooler since it comes with a lifetime warranty. This gives you a guarantee that you are investing in a dependable and efficient cooler. Another exceptional thing about it is the attached cargo net which provides extra storage space inside the unit. You can store delicate items which you would like to isolate from the heavier items. This cargo net protects your items from ice and water which might cause damage. Check the best price of ORCA with Lid & Bottom from here. Cargo net which provides additional storage. Summary :- This one is a top quality cooler which comes with a lifetime warranty. It also comes with a cargo net which creates more storage space. 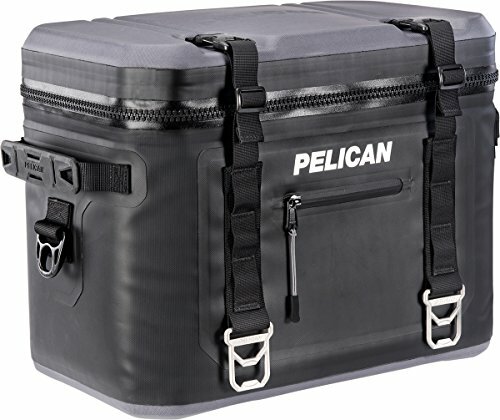 Pelican Elite 50 Quart cooler is a very unique model which has a high rating on Amazon. It is a small cooler with a robust quality. It is very efficient and it can hold up to 12 gallons. This capacity is sufficient for anglers, beach lovers and campers. The best things you will like about the unit is that it comes with a lifetime warranty which gives you an assurance that you are purchasing a reliable cooler. Apart from the warranty, it comes with other additional features which includes; a measuring board, self-draining cup holders and molded handles for easy transportation. It also comes with anti-shear hinge system, stainless steel bottle opener and molded-in tie-down slots. Furthermore, it features head gaskets and isolation walls which provides an excellent ice retention of up to 10 days. This means that the device can keep your drinks frozen for more than a week. Additionally, it comes with quality latches which seals the lid to prevent air from exiting. It has a robust polyethylene shell which enables it to withstand harsh conditions. Lastly, it comes with non-skid feet which give it stability. Non skid feet which gives it stability. Summary :- The best thing about this cooler is that it comes with non skid feet which boost stability. It also comes with self-draining cups holders. Here is another high-end cooler you should consider. The first thing you will notice about this unit is the rugged design which allows it to withstand some hard tasks. It also comes with a textured lid with reliable latches. The thick urethane insulation keeps ice for up to 5 days. To make your work easier when opening, it has a vacuum release knob which allows the lid to open easily. The freezer grade seal ensures that air does not leak from the cooler. You should also note that it comes with rubber feet which prevents it from slipping or sliding. This ensures that it remains stable even when you have placed it at the back of your car. Unlike others, it comes with two bottle openers on both sides which acts as a locking point for a padlock. This ensures that your items are safe and secure. Inside the cooler, you will find a separator which also acts as a basket for dry goods or a cutting board. You will also find a drink holder which is attached on the outside. The device also comes with a 5 years warranty. Lastly, it features a screw-over plug tether which drains the melting ice. This plug is made of stainless steel that prevents it from getting lost. 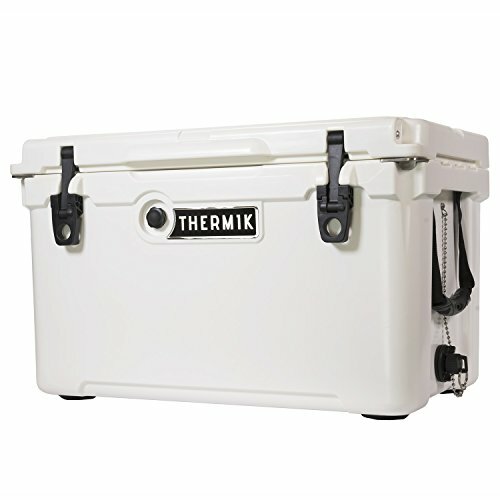 Would you like to learn more about Thermik High Performance Roto-molded Cooler, 45 qt, White? Check out why it has a very high rating on Amazon. Rubber feet prevents it from sliding. Separator can be used as a cutting board. 2 bottle openers which acts as a locking point. Freezer grade seal which prevents air leakage. Ice retention for 5 days only. Summary :- This one comes with amazing features such as freezer grade seal, 2 bottle openers unlike others. It also comes with a 5 years warranty. This one is among the most incredible Rotomolded coolers you will ever find. The best thing about Milee coolers is that they are available in different sizes which are; 45 quart, 35 quart, 60 quart and 75 quart. One of the most important features you should check when buying a cooler is the handles. You will find that the handles which comes with these coolers are made of nylon and are very comfortable. You can easily remove them in case you don’t need them. When using this cooler, you are assured that it won’t be damaged easily since it has a rotomolded thermoplastic construction. The antiskid feet provide a safe landing in case it falls. Unlike others, it features a pressure release button which allows you to open the cooler easily. Moreover, it features a refrigeration-D seal which provides an air tight seal. This ensures that your drinks or perishable goods are always in good condition. Additionally, it comes with a T-latch system which ensures that everything in the cooler is safely locked. The latch is perfectly designed which enables it to withstand all conditions. It also features stainless locking plates which ensures that the latch is locked in place tightly. On top of that, it comes with a drain plug which enables you to open the cooler and drain water. Lastly, it comes with a chopping board, basket and cup holders which allows you to separate things easily. Check out customer reviews from here. The first thing you will note about this cooler is that unlike others which comes with different features and accessories, this one has a straightforward design. The robust construction enables it to provide an outstanding performance. To start with, it features a 840D TPU double coated material which makes it resistant to tear, cuts and scratches. As a result, it is among the best you should consider for outdoor activities. It also comes with a reliable latch system. You should also note that it is manufactured from a non-skid material. This material is also used on the lid to make the cooler firm and lightweight. This one is a very rare feature which you cannot find in many coolers. Additionally, it has quick access dual locking system which enables the lid to remain tight. It also features a zipper which also provides a tight seal. Due to this, it is able to retain cold air inside the cooler. The unit comes with a 3-year warranty. It doesn't have a lot of features as compared to other models. Coleman Heritage 150 Quart comes last in our list but this doesn’t mean that it has a lower quality than others. However, it might not be as strong as the high-end models. It is the best for those who are on a tight budget since it is among the most affordable coolers for camping you can find today. The most amazing thing about Coleman Heritage XP H2O is that it is spacious enough and can hold up to 223 cans of drinks. You will find that it can accommodate more items as compared to most of the high-end models. It measures 42 X 19 X 9 Inches. Another thing you need to note is that it also has a good ice retention capacity of up to 7 days. For those in need of a lightweight cooler, this one might not be the best especially when full. It has a very efficient design which allows the lid to close tightly even without latches. In addition, it comes with 4 molded cup holders at the top. It also features 2-way handles which allows you to carry it comfortably. It is spacious as compared to other models. It comes with 4 cup holders. Easy to close and open. It can be very frustration when you invest in a cooler for camping only to realize that it is not reliable after several weeks or months. When shopping for a cooler, you need to ensure that you will get value for your money. To make your work easier, we did a lot of research to ensure that all the products in our list are indeed the best. Firstly, our research was based on the customer’s experience. You will find that all the products in this list are top rated in various online stores and have a very high rating. We also compared the features and prices of the different prices to give you a list with affordable and very reliable options. We also confirmed from various product experts about the quality of the coolers. You can also see that the products have a reasonable warranty which proves that they will meet your expectations. They are also made of strong materials which makes them durable. Additionally, you will find that they have a perfect ice retention capacity and most of them comes with additional features such as a cutting board, bottle opener among other impressive features. This means that you are assured that irrespective of your choice, the product you have selected will give you value for your money. Look for any of them now. Here are some of the things you should do to prevent ice from melting. Keep the icebox away from the sun – This one is obvious and it means that you should keep the cooler in the shade as much as you can. Prepare the icebox –You can put a layer of crushed ice around the icebox a day or a night before you use the cooler. Cooling your icebox before greatly helps to prevent the ice from melting once you have place other items in the cooler. Fill the icebox - Ensure there is no space on the icebox. The more items you have in the icebox the less air there is which needs to be cooled. Don’t open the icebox frequently – Once you open the icebox, you allow hot air to get into the cooler. This also allows cold air to escape from the cooler. Add salt - Adding some salt to the water before you freeze greatly helps to lowers the freezing temperatures. This means that the ice will be colder than the frozen fresh water. Seawater works better once you have added salt to the water. Add drinks- Putting drinks in the icebox helps to prevent the ice from melting. The cold drinks prevent the block ice from melting. Block ice – Block ice keeps the icebox cold as compared to crushed ice. When using block ice, you are assured that the ice will remain intact and won’t melt easily. If you would prefer to store your items cold for a long time, you need to use ice blocks in your cooler instead of ice cubes. Ice cubes melts faster than ice block due to their density. Instead of buying the ice blocks, you can make your own since it’s more cost effective than buying. Measure the dimensions of your cooler using a measuring tape to ensure that ice block will fit. Use a plastic or a metallic pan with appropriate dimensions. You can use plastic dishwasher plans if you have a large cooler. Clean the pan using soapy water before you use it. Fill it with water to about 90% capacity and keep it on the counter which is adjacent to the freezer. When it freezes, the water will expand to create space at the top of the pan. 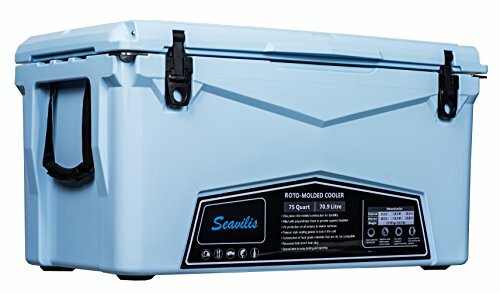 How do I determine the best cooler for camping? Answer : Go through the product features and compare the prices of the various products.. It will be very easy to find one that meets your requirements since they come with different features. Is it easy to find cheap coolers? Answer : The price of a cooler depends on the features. Most of the expensive models have more advanced features which makes them better than the cheap models. However, you can still find affordable models. Which one is the best cooler for camping? Answer : All the products in our list meet the requirements of quality coolers. You can pick any which you feel that it perfectly meets your needs. If you are one of those who love camping, you need to invest in a quality cooler. This will ensure that your food and refreshing goods will last for several days when camping. However, you need to be careful when buying a cooler since not every cooler on the market is of great quality. If you want the best, look for any cooler from our list. All of them are quality products and they all have a superb ice retention capacity. They are also durable and easy to carry. Apart from that, they come with different features and prices which allows you to identify a suitable cooler easily. You can also find a reliable cooler with any budget. A good cooler should be portable, durable and should be spacious enough to accommodate your items. Lastly, you need to check is the warranty, this will also guide you to determine the quality of a product. Consider all the things we have mentioned and you will be able to select a suitable cooler for your camping needs.